Though Vancouver, Toronto and Montreal are the most celebrated and best known Canadian cities, Ottawa is the national capital. But don't equate this city's relative obscurity with blandness. Like many of the world's best capital cities, Ottawa showcases national finery in the way of museums (like, lots of museums), architecture and governmental and historical highlights. Sitting at the convergence of three major rivers in northern Ontario, Ottawa has a beautiful natural geography and expanse of green space and waterways, including the Rideau Canal that winds its way through the city. Building height restrictions and pedestrian-friendly areas have kept the city human in scale and comfortable to navigate. This Ontario city has a cultured, yet friendly vibe. 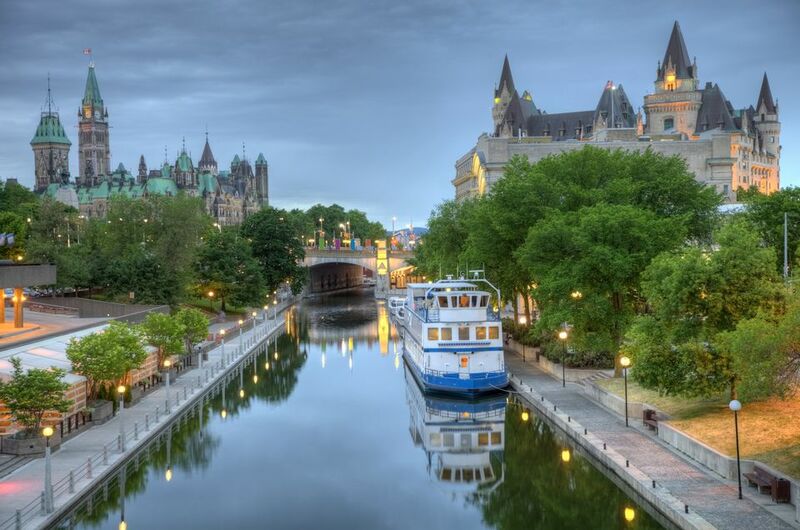 If nightlife and shopping are your activities of choice, Ottawa may disappoint, but to get a feel for Canada and its people at a relaxing pace, this is the place. 2 p.m.: Check into your hotel. The Château Laurier a Fairmont hotel is one of the most iconic buildings in Ottawa. Its French gothic architecture and lavish interior will make you feel spoiled. Plus, the location is prime central. Even if you don't stay here, you can drop in for high tea or meander the historic halls, like at any of the historic Canadian Fairmont railway hotels that dot the country. Be sure to peruse the gallery of Yosuf Karsh photographs on the first floor. You will likely recognize many of them — they're some of the most famous portraits in the world. Public transportation around Ottawa is quite good. Get a day pass (CDN $10.25 as of 2017) if you plan to use it much. 3 p.m.: Head straight over to the National Gallery of Canada. The impressive glass and granite structure houses superb Canadian, indigenous and international works of art and features important seasonal exhibitions. Catch spectacular views of the Canada parliament buildings from inside the museum. Don't miss getting a photo with the giant bronze spider — Louise Bourgeois's Maman — that greets visitors outside the gallery. 6 p.m.: Poke your head into the Notre-Dame Basilica to behold its impressive interior before it closes on your way to the ByWard Market. Ottawa's number one attraction is this pedestrian-friendly neighborhood full of boutiques, galleries, and restaurants. In addition, it offers a year-round open-air farmers' market, but this usually shuts down around 5:30 pm. 8 p.m.: After meandering the Byward Market, settle in for some European food with a German twist at Das Lokal, just away from the market's touristy hustle and bustle. Good idea to have made reservations for this cool restaurant that offers an edited menu, but good portions. Expect live piano on the weekends. 8 a.m.: While you're still bright-eyed and bushy-tailed, tackle Canadian Politics at Parliament Hill. While some may find politics a tad boring, the Gothic revival trio of buildings that houses Canada's government cuts an impressive silhouette high above the Ottawa River. Tickets for a free tour that lasts about 20 minutes are available across the street at 90 Wellington Street beginning at 9 a.m. Get there early as they do run out. The tour includes a trip up the Peace Tower, which affords an excellent view of the city. 11 a.m.: Grab a quick and healthy lunch at nearby Cafe Nostalgica before heading to the National War Museum. Though Canada is a peace-loving nation, this museum provides an intriguing journey through the personal, national and international dimensions of Canada's military history. Displayed artifacts and exhibits convey the experiences of women, men, and children who lived through the conflicts that have shaped Canada, Canadians and the world. Other museum options that may be more tailored to your interests include the Royal Canadian Mint and Currency Museum, where hand-crafted collector and commemorative coins, gold bullion coins, medals, and medallions are created. The Mint's well-trained, engaging tour guides really make currency interesting. It's free to visit. Also, the Supreme Court of Canada is the country's highest court. Visitors are invited explore the building, which is notable for its architecture and art collection as well as to learn about the operation of the Canadian judicial system from tour guides, all of whom are law students. 2 p.m.: Hit one more museum before the day is out: The Canadian Museum of History, which is actually in Gatineau Quebec, is a mere 25-minute walk away over the Alexandra Bridge. If walking isn't in the cards, you can take an aqua taxi across the Ottawa River in summer, rent a bike or take a 15-minute bus ride. The undulating museum is spacious and architecturally intriguing and houses a unique collection of objects that depicts Canada's history. 5 p.m.: On your way back to Ottawa, stop at Nepean Point, a lookout just over the bridge that offers a panoramic view of the city and a commemorative statue of Canada's founder, Samuel de Champlain. 6 p.m.: So as not to spoil your dinner, split a BeaverTail pastry with your companion at the ByWard Market location, as this is Ottawa's patented tasty treat. Calling them what they are - sugary fried dough — hardly does them justice. 7 p.m.: Just to get away from the touristy part of Ottawa for a spell, set off for Westboro, a hipster urban village where a pub or a yoga studio is never far away. The area features many high-end shops and boutiques and is a ten-minute drive from Parliament Hill. Stroll the Westboro neighborhood with the locals until dinner time at Vittoria in the Village on Richmond Street. 8 a.m.: To start your last Ottawa morning on the right foot, head over to the Scone Witch on Elgin Street. It's a busy place, but the scones are light, flaky and warm. Full breakfasts are available but seating is limited, so the earlier, the better. Grab some scones to go. For a more indulgent breakfast, dine amongst the politicians and well-heeled tourists at the Chateau Laurier's Wilfrid's breakfast buffet. 10 a.m.: Cycle that meal off with a gentle, two-hour guided cycle tour along the Rideau Canal with either VeloGo bike share (various locations, self-serve) or with the friendly folk at RentABike on Rideau Street. Alternately, make your way to Dow’s Lake for a paddle in a pedal boat, kayak or canoe. If it's a crummy day or you just need one more museum under your belt, Diefenbunker, Canada's Cold War Museum, is a fascinating look at nuclear fallout bunkers built by the Government of Canada at the height of the Cold War. It's about 40 minutes away from Parliament Hill, but one of the most highly rated museums in Ottawa, especially for kids.